Neria and her twin sister Lilly were born in a freighter that was traveling through deep space. Neria learned the the skills necessary to become a pilot at an early age. Neria's father was from Kiffex, homeworld of the Kiffar and her mother was a Zeltron. It was a place the twins only heard of from the holovids and the stories their parents shared with them. It was difficult for the twins to make friends as they were the only children on the ship. Sometimes they would stay over on a space colony with their mother while their father would haul goods for the local companies in the area. It was easy to make new friends for both sisters, but keeping friends was more difficult as they would never stay long at a space colony. So the twins really had only each other to share their stories and secrets. Their bond was strong and nobody could come in between them. At the age of 16 a small pirate gang entered the freighter of her youth. The rogues proceeded to loot the ship and execute everyone on board. Neria's father led the resistance, but it was no use. The pirates were far more skilled in the arts of war. They soon overwhelmed the crew. Neria's sister got separated from the group, while Neria was with her parent fighting off the pirates. Having no contact with her sister they didn't know if Lilly was still alive. With one last act of defiance Neria's father told her to run for their shuttle and get it ready for launch. Her father and friend Enrius covered her run for the ship. Her mother followed close behind. Neria reached the shuttle, boarded it and fired up the engines. She ran back down the ramp at the back of the loading bay just in time to see her mother gunned down by the pirates. Her father yelled at her to go on without them. Neria saw him and Enrius being executed by the rogues just as the shuttle left the docking bay. She didn't know what happened to her sister. Neria escaped the carnage and flew away in tears. She decided to go to the desert planet close to where they were: Tatooine, a hot, dusty hideaway. From there she started her search for her sister. First she looked on Tatooine with the help of a little Jawa. She followed rumors about pirate gangs selling people off into slavery. She kept telling herself her sister was still alive. She starts to work for Rev Cozmo, a skilled business man building up his company, who is in need of pilots. Thus, Neria goes to the Starport of FFC Budnik and waits for her ride. There's not much to see in Budnik and the starport is clearly not the most important one on Tatooine and there's barely any entertainment in the city, thus Neria is sitting there staring out in front of her, when suddenly a YT-1210 called the Sledge Hammer arrives. A rather handsome man steps out and heads to the Admin. post, then heads to the cantina where Neria is waiting for days now. Finally her transport arrives and she's off to pick up her ship, and to start her first job as a freelancer. Neria and Rev Cozmo become close friends, and she tells him about her life and her dreams. After a while Rev tells her to go own her own and pursue her dreams, so with her ship Rev has given to her she sets out. But freelancing is difficult if you don't have a reputation. So after a while and some ungrateful jobs she contacts Hemi and he brings her in contact with Anax Noctru. Mr. Noctru, who is planning to start up a new company, offers Neria a spot in Byblos Drive Yards. There she quickly rises up in the ranks and becomes Head of Sentient Resources, but most important Neria is close to the man she loves. 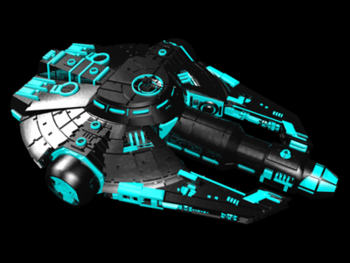 Hemi Cuda, who is the Head of Prospection spoiles her with many gifts, one of them is a YT-2000 called Neo. She starts to get a reputation of being among the best recruiters in the galaxy, some don't like her because of snatching those still green in a cockpit, but many respect her for it. Most of the recruits are grateful for her help and the care and time she puts in training them. She guides and helps every recruit personally. She gains the trust of most members of Byblos Drive Yards and the members count quickly rises to more than 40. But after a while she feels HC isnt that active; she becomes frustrated by the lack of leadership plus her current relationship is slacking as well and decides to leave BDY. Followed by 3 other members, she joins Tresario Star Kingdom. Meanwhile she met Redjon Mirrabel, and he becomes a close friend to her along with Davos Markus, Kaal Derycke, Eira Cardas, Ghecko Hex, Eta Carinea, and others. She decides to do something completely different and join the navy of TSK, where she has yet to prove her skills. She isn't a recruiter anymore, which is something she does miss doing in her previous organization. She joined TSK with Davos Markus (one of her first recruits and friends from BDY), Kaal Derycke (her little Jawa friend from Tatooine), and Redjon Mirrabel who she met in a tavern on Polis Massa and joined BDY for a short while. After one month in service she receives a promotion for her work; she gets promoted to Lieutenant Junior Grade Her CO notice her work ethos and recommends her for anther promotion. At the ceremony she takes the oath and pledges her loyalty to Tresario Star Kingdom, its citizens, the King and Hall of Ministers. The Tresrian Navy undergoes some changes, Neria gets a new CO and is assigned in a special task group, under command of Barnaby Black. Both grow close to each other and start a relationship, despite deep feelings for each other, they keep their relationship separated from their assignments. However Neria would do everything BB asks and she cares allot for him Meanwhile Neria gets promoted to Lieutenant Commander and is rewarded for her hard and excellent work, Admiral Zeff Traner awards her with the next words: "Lt. Com. Derycke, your work within the navy has been fantastic. Your dedication to the tasks assigned has been of a character rarely seen. It is with that spirit that I award you the Expediency Point of the Kingdom Star." Neria receives her first Kingdom star point, and hopes to receive many more. However, Tresario is not what Neria though it was. Despite her hard work, she feels HC limits the freedom of its citizens and those defending Tresarian space too much. Her attempts to make the government less bureaucratic and ways to motivate those working for the said government are either limited or just refused without consideration. The paranoia towards those that proven to be loyal and effective is frustrating Neria. After a small fallout with HC and HoM Neria leaves Tresarian space. She still feels she is a Tresarian, but this Tresarian doesn't like the way how she is beeing treated by her king and Hall of Ministers. Officially Neria is no longer a Tresarian and has no home to go to. After some wandering around in this large Galaxy she joins the Trade Federation as Citizen. Barnaby Black remains in Tresario, but their love is still burning strong. Even if they will be so far away from each other. On Year 14 day 10 Neria receives yet again a offering to return to Byblos Drive Yards by Anax Noctru. This time as leader of Byblos, Byblos that has been in decline since she left Byblos for Tresario. Neria has free reign of command and can decide how BDY runs, she accepts the offer from Anax and heads back to Polis Massa. Once she arrived she starts to reform the company with the goal to create a tight knit community and to make Byblos one of the biggest ship producers there are. At first Neria was a bit frightened for the reactions of the members in Byblos towards the sudden change in command, but most accepted her as they knew her still as the person that took care for the employee's of Byblos almost a year ago. She gets rid of the micromanagement that slows down the production progress of Byblos, place new people in directive positions and reforms the recruitment division. After one month of hard work everything that needs improvement, scrapped or reformed is almost completed. Each department has the freedom to work how they see best, as long the results are positive. Soon after the company starts to grow again and slowly the sales improve, plans are in progress to expand the Byblos Community. After a fallout with the owner of Byblos Drive Yards, Neria resign her possition as President of Byblos. Among the many job offerings she decides to join The Tion Hegemony, she signs up for duty in the Hegemony's military and is assigned to the 2nd fleet, The Crimson Lions. By year 14 Day 245 she is a well respected member of the fleet and is given multiple assigments to carry out. One of them is to start up the Sentient Resources Project with Stephanie Barefoot-Rodes. Furthermore, she finaly finds the time to set up a small company called Derycke Enterprises with the idea to turn the compnay into a major corporation that will represent more smaller company's under its wings. As Neria and Stephanie are starting up the SRP project, they propose the first job of SRP is to organize Tion Hegemony's 5th aniversary. As a founding member of the Galctic Concordiate they think its a perfect oportunity for Tion to open the doors of the Crystal Hall for geusts of the GC and join in the celebrations. As a symbolic and friendly gesture towards Tions allies. Neria and Stephanie gather a team of Tionese citizens to help with this event. And after 2 months of hard work on Year 14 Day 300 tion Hegemony opens its doors for foreign delicates for the first time. The masquerade ball and the celbration is a huge succes, the citizens of Tions capital city Meeshea reciece their geusts of the Trade Federation, Mandolore, Hapes Consortium, Aurodium Legion, Avance Coalition and the Akethon Corporation with open arms. especial the Hapanii's, Mandolorians and the Trade Federation are threated with great respect due their recent involvment and assistance in the Cron Conflict. Its also the proof Neria was looking for that the SRP project is a succes and she starts up several more projects that will benefit the Tionese citizen and the Tion goverment. Including setting up deals and arranging matts supliers for the citizens for easier acces and better prices, introduction to the galactic market and guidance for setting up private projects a citizen wants to start. But SRP also involves itself in assisting the Tionese goverment in deals, research and more. But the grand project for SRP would be finishing the academy project where Tion is working several years on, the Andy Quick academical institute. Neria is wedded to Barnaby Black at the Voss Mystics temple in the city Voss-Ka. A new order founded by Barnaby that serves the Tion Hegemoy and its citizens. Beeing engaged for almost a year now, they always had to delay the wedding, either because of Neria's work within Byblos or because of Barnaby's project within The Tion Hegemony. finnaly they decided to put their work on pauze, set a date and planned to towards that date. Many of their personal friends, family and citizens of the Hegemony came down to the city Voss-Ka where the rebuilted temple of the Voss Mystics is located. The Oracle of the temple performed the service, while the Crimson Lions (Fleet where Neria served) and the Golden Krayth Dragons (Fleet where Barnaby served)formed the gaurds of honor. The Admiral of the Crimson Lions Mercurio Ploméz gave Neria away. Neria asked the Admiral as a sign of respect for the Admiral while Stephany Barefoot-Rodes was the bridesmaid, who has always been a support and like a sister for Neria. The best man of the ceremonie was Scott Hood, friend and family of both Neria and Barnaby. The wedding took place in the central hall of the temple, attented by many high ranking citizens of the Hegemony. A sign that the couple was much celebrated within the Hegemony. Neria is a cheeky girl who speaks her mind. Mostly she gets away with it, but from time to time it gets her in trouble, especially after speaking up against important sentients. Luckily she can count on her many friends to support her and speak up for her. While she may go too far from time to time, she is loyal to those she considers friends, and more importantly, to the citizens and king of Tresario. Neria has many big dreams. She reaches for the stars, and if she can, she will share her luck and success with those who are dear to her. She does not pursue wealth, but instead seeks to prove that she is more then just a space kid. She proves herself by rising through the ranks of Tresario's navy, and previously by becoming Head of Sentient Resources in Byblos Drive Yards. Another dream is to have her own house. Although she has been mocked for her goals by some, these reactions only increase her determination to succeed, to spite those who criticize her. She is trained to serve in the Navy, and while growing up on a freighter gave her a head start in piloting ships, she also learned Navy tactics and procedures quickly. Her fighting skills come primarily from her search for her sister. Neria and Lilly Derycke are twin sisters. They grew up on a freighter together until a pirate party raided the ship. After 8 years of searching, Neria received a tip about where her sister might be. She requested a search and rescue mission from High Command, and they agreed, provided she remained undercover. Under the command of Lieutenant Commander Barnaby Black, the Tresarian navy set out and boarded the vessel. Lilly was found and rescued. Now the sisters are reunited and both are serving Tresario with proud and dedication. 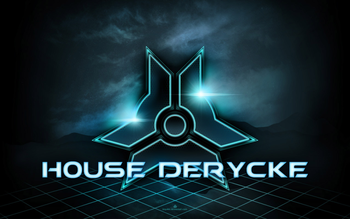 They both are in the progress of setting up a house, so the Derycke family will have a home and can leave their physical mark on the galaxy. Written by Neria Derycke, 6 years ago. Last updated on Year 14, Day 332, 05:51:27.